CHEAT! – I don’t know about you, but this is one my favorite games. Something like, "omgzz dis iz lyke mi fav game evaaaaa!" Maybe it’s the fact that you have to cheat sometimes to win and accuse other people of cheating to get them to pick up the pile of cards. Cheat is also pretty much one of the most popular Neopian games as well. Why? Well for one, it’s an easy trophy and the game itself is rather addicting. So you know how to play and maybe you’ve even received your own Cheat trophy. Or if you haven’t, don’t worry; the game can be tricky at times. Let’s just say if you’re on the last round with Spectre, Cheat champion, you basically have to have the right card on your last turn; otherwise, he’s going to accuse you. Capara: Err… no, I actually did have two fives. I watched Timmy scowl and pick up the pile. The Tuskaninny had a large amount of cards in his hands. Me: --like, I was saying, a very nerve-wracking game. Yeah, the tension is so high that you couldn’t even cut it with a butter knife. Well, that’s because butter knives are pretty much useless since nobody uses butter that frequently anyway and they can't cut stuff. Except butter. [cheery tone] Back to the action of the game! Little Timmy the Tuskaninny! Nice to meet you, have long have you been playing Cheat? Timmy: Not long enough… CHEAT! Now it was Branston who looked up at Timmy’s round face. The Eyrie was wearing a large gold medallion and an annoyed face. Branston: No way, man, pair of eights; I’m no cheater. Me: But, isn’t cheating and lying the point of the game? Princess Fernypoo: That’s why he never wins. Branston: [vainly] I’d rather be on the dance floor struttin’ my stuff or winning a trophy that way. All I need is my moves, my medallion and my style… yeah, man. Peace. Me: Umm, yeah, I see. Right on, brother. Brucey B: [after Chuffer Bob’s turn, he looks at me] I’m Brucey B, by the way. I was involved in a long Lost Desert plot years ago in search for the lucky coin. I found it, all was mellow again, and that’s when I retired from adventure seeking and took up this game. I believe it’s my turn: one ten. Me: How exciting… so, you guys play Cheat all of the time? Agent 00 Hog: Yes and I, for one, never tire of it. See, that’s because I usually always win. I’m a master of most card games and I do enjoy the Stock Market as well. Me: Have you ever met Nigel the Chia? Agent 00 Hog: Nigel… [thinking] You mean that Chia sitting in that red thing with wheels and always talking into that black rectangle? Yes, I’ve seen him on occasion. Me: It seems like most of you are famous for something. Timmy: Oh shut up. And CHEAT! I watched Agent 00 Hog sigh and flip over his two kings. Geez, why on Neopia did Timmy think everyone was cheating? No wonder he only had the seventh spot on the line of Cheat players from best to worse. Capara, who had the first spot, didn’t seem too keen on the game either. The Kyrii would occasionally appear bored and let her cards fall a little, permitting just about anyone to see them. As I sat with the eight famous Neopians, I started to think about each player. Capara was the worst player, Timmy kept calling out cheat after almost every card and Agent 00 Hog seemed to know what he was doing. This led me to wonder if there was a better game player than the Moehog who worked with the Stock Market. The next voice answered my question. It was a little strange how the room grew deathly silent in just a matter of seconds. The red Jetsam who made the call was dressed even nicer than Agent 00 Hog and was wearing a very smug look. He grinned, white teeth gleaming. Spectre: Come on, nobody wants to challenge me? I said three aces! Not even Little Timmy called Cheat on this one. I noticed that and readied my pen and paper for an answer. Me: [to Kalora, sitting next to me] Who’s that? Kalora: His name’s Spectre. 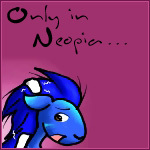 He was the first Neopian to earn over one million Neopoints. He’s famous for his riches and for his amazing cheat skills. No one ever challenges him. Me: Never? He has to be cheating sometimes! Kalora: I think we’re all afraid to find out what will happen if we bother him. Me: [completely ignoring Kalora’s warning] Spectre the Neo-millionaire! How’d you get all those Neopoints, big guy? What’s up with playing Cheat when you could be showering in your fortunes right about now? Spectre: [leaned across the table, gave me the fakest smile I’d ever seen] I play Cheat because I always, always win. I win because I’m successful in life. I’m successful because I’m rich. And I’m rich because I work for every little coin. [grabs me by the collar] Got that? Me: [smile slowly starts to fade] Yes sir, Mr. Spectre, sir. [slumps back down into chair, turns to Kalora] Real funny guy, eh? Thus began the repetition of going back to Capara and around to Spectre once again. After it passed Little Timmy, who was cheating, and Branston, who wasn’t but was called out anyway, it came to a purple Meerca who put down a five. Me: You must be Chuffer Bob the Meerca! In the middle of the line of Cheat players. Me: So what do you like to do when you’re not playing Cheat? Chuffer Bob: [adjusting the tool belt around his waist and giving me a proud, toothy grin] Actually, I’m a construction worker. I build Neohomes. See the best thing to use is Plywood. Strong, reliable stuff that is. Me: And your Cheat strategy is…? Timmy: Brucey, you’re hiding the cards again? See, I knew you were a cheater! Brucey B: Uh… no I’m not? Me: [dodges a ceramic plate that seemed to have appeared out of thin air] So um, is this game? Princess Fernypoo: [red-faced] No… this is WAR. I found it pretty funny that there was really this much chaos going on in the Cheat room. Geez, I mean Fernypoo had Capara in a headlock, Chuffer Bob was trying to tear them apart with his crowbar and Agent 00 Hog and Spectre were casually discussing the Stock Market. The room grew awkwardly silent. From what I was told, no one dared to challenge Spectre, even when he practically begged them to. But Little Timmy in all his punk clothes was standing on the table now, this time looking confidently down at the Jetsam. Every Neopian had stopped what they were doing to see what was going on. Branston had pinned Brucey B to the wall and Capara and Princess Fernypoo froze. Branston: That was uncalled for, Tim. Spectre: [shrugging nonchalantly] He’s right. I was cheating. There you go! Someone finally did call Spectre a cheater after all and it was one of the most inexperienced players. Spectre still won the game, though, but I guess in their book a new record was set today: Timmy’s accusation was correct. On my way out, I clutched my notebook full of the insanity that had occurred in the Cheat room. I was definitely going to send this in… After all, Neopians had a right to know what went on between the eight players. A sudden voice stopped me. Me: [spinning around, noticing the Jetsam and applying a cheesy grin] Hey, interviewee! Hey, that's a funny word. Wow, you’re a lot shorter than I thought you’d be. Spectre: [scowling up at me] Listen, I’ll pay you ten thousand Neopoints right now if you don’t send this interview in. Me: Ten thousand? Err… why? Spectre: Well… the entire world doesn’t need to know about the craziness that I have to deal with every day when I come to play my favorite game. It’ll make me look bad, okay? What are people going to think, that I hang out with a bunch of wackos? Me: I get your point, but how about fifteen thousand? Spectre: [withdrawing a sack of Neopoints from his jacket] Fine. Me: [gleefully takes the sack] Thanks! He really expected me to pretend the interviews never happened? I hadn’t come all this way to be swayed by some fancy millionaire’s Neopoints. Nope, the interview was most important to me. But since I had the points, would I still send in the truth about the Cheat room and its bozo players? Sure I would. Sorry Spectre, I guess I’m a cheater myself. Author’s Note: And that, friends, is really the wackiness that goes on the in Cheat room. Thank you for reading, hope you liked it. As for me, I will be flying to Faerieland via Eyrie Cab tomorrow to avoid being hunted down by Neopia’s most gullible millionaire once he sees this article (edited by beewitched2). Seeya!